After months of rumors we’re getting our first look at Google’s new phones, the Pixel and Pixel XL. The phones are a huge freaking deal for Google, because they are the first flagship Android phones from the company that don’t use the “Nexus” brand name. More than a change in name, the phones reflect Google’s biggest ideas yet about how you interact with the device you carry everywhere. The phones still bear many of the same characteristics that you’d find in a classic Nexus device. First, they contain little-to-no wireless carrier modifications (such as a custom UI), making them the most pure version of Android you can buy. They’ll also be among the first phones to receive updates when those finally roll out. Importantly, the phones are the first to use Google Assistant, the company’s new artificially intelligent companion that can help Android users search for photos or even make plans. The assistant is similar to Siri, but the crucial difference is that it’s powered by Google’s search engine, so it can answer more elaborate questions and conduct more complicated tasks. Google Assistant can be activated on the handsets by saying the words “OK Google,” or by simply pressing and holding the home button. Whether you’re on your home screen or inside an app, you can ask the assistant for information or help with tasks. Things like “show me my photos from last October” will bring up images stored on your phone. The assistant makes it easier to find specific files, make plans around town, or operate your smart home. Owners of last year’s Nexus 6P and 5X will probably be drawn to the new Pixel phones and immediately notice the fingerprint sensors are once again on the back of the devices. It’s a weird design choice that Google introduced on last year’s phones, and I’m glad it’s sticking around. The rear-facing fingerprint reader somehow feels even more effortless to use than placing your thumb on a home button. It’s super easy to get used to. Both Pixel phones also have a headphone jack, so wired headphone uses can breathe a sigh of relief (at least for now). The phones are basically made to compete directly the iPhone 7 and iPhone 7 Plus, and most of the hardware does. Although the hardware does stack up to the iPhones, the Pixel phones are not waterproof or dustproof, something featured on most flagship Android phones. Both of the new iPhones are also waterproof and dustproof, which makes Google’s decision even more peculiar. Although the inclusion of a headphone jack might be enough to sway some people toward the Pixel, but we’d advise you let it go and focus on some of the other attributes. The new phones get a solid bump in hardware compared to last year’s models. The Pixel and Pixel XL both run on a Snapdragon 821 processor, which means they should be able to run 4K video and multiple apps a lot better than the Nexus 6P could with its Snapdragon 810 processor. The Pixel XL screen is slightly smaller than last year’s Nexus 6P (5.5 inches and 5.7 inches respectively), but it manages to display the same resolution (1440 x 2560) and even packs in a higher pixel density, which should mean it emits a sharper picture on a smaller screen. The smaller Pixel phone only has a 5-inch screen that displays 1920 x 1080 resolution, which is nearly identical to last year’s Nexus 5X. 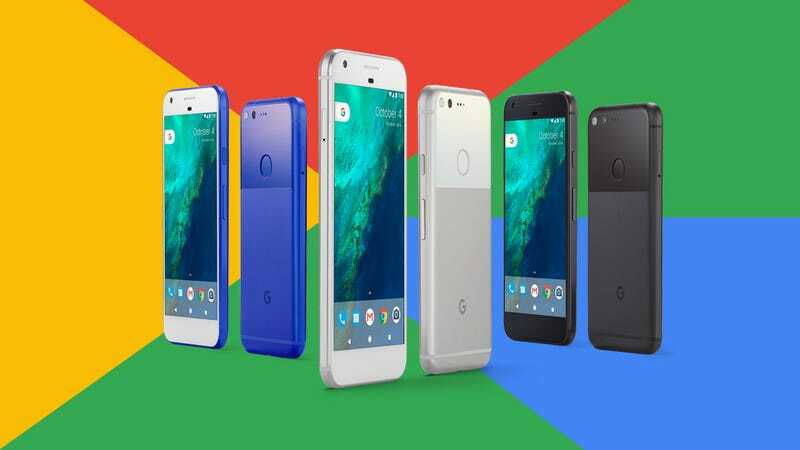 The Pixel does have a slightly higher pixel density, but the difference is so marginal, we don’t expect it to have any bearing on the look of the screen. It will be interesting to see how the cameras on these new phones stack up to last year’s models in our hands-on tests. Both Pixel phones come with a 12-megapixel rear camera that appears to be good enough for most average users. The Pixel phone cameras shouldn’t be as good in low light as the iPhone or Galaxy S7 because they only have a f/2.0 lens (for comparison, the iPhone 7 has a f/1.8 and the Galaxy S7 has a f/1.7). The specs haven’t prevented Google from touting the camera’s abilities. The Pixel phones have apparently earned an 89 DXO Mark Mobile rating, the highest of any mobile phone ever. Google claims it’s the best camera phone ever made, but we’ll believe it when we see it. One of the last things you’ll notice about the Pixel phones is that they both use USB-C ports for chargers, something that’s still quite rare. Although dozens of products already rely on USB-C for charging purposes, two of the most popular smartphones—the Galaxy S7 and iPhone 7—do not. The fact that these new phones use USB-C will definitely help cement the new standard and get more people to start using it. In a huge bummer, the phones will be exclusive to Verizon, which means they’ll probably fall short of the kind of mainstream appeal Google is hoping for. The sliver lining is that Google will offer the Pixel unlocked in the Google Store. The Pixel phones come with a hefty new price tag, which is also a departure for Google. The phones start at $650, and they’re available for pre-order today.